Seeing Grace Village, and all Healing Haiti is doing through Grace Village, was SO hopeful: 400 children attending the Grace Village school; 4 family-style homes for orphans who as a result, no longer consider themselves such; 26 orphans with a place to live until Healing Haiti can reunite them with their families; a medical clinic; plans for a dental clinic on the way; a church; and a soon-to-open bakery and restaurant to continue creating jobs in the area. Currently, over 120 Haitians work at and run Grace Village. It is amazing to see the work that is being done here to empower the Haitian people, create jobs, and provide a stable environment and education for kids. Over the past few days, I’ve been working through trying to understand our role here; in light of the extreme level of poverty, what does our visit here really accomplish? I’m a “doer”- I like tasks, I like projects, I like to see results, and I like measurable outcomes. I’ve struggled with the parts of this trip that are “just” holding kids and helping carry buckets. When faced with such complex and seemingly insurmountable issues such as the extreme poverty in Haiti, I’m still learning to be more like Jesus (willing to serve and love the individual) and less like the disciples (“when will we overthrow the Romans already?!”). But what I starting coming to realize when I was at Grace Village is that it’s not about our individual team and what we do in our minimal time here; rather, it’s the culmination of ALL groups that come here to learn and to serve, and it’s the underlying fact that these visiting groups provide funding that helps Healing Haiti create these opportunities for education and job creation. And that cumulative work is generating incredible results with measurable outcomes. 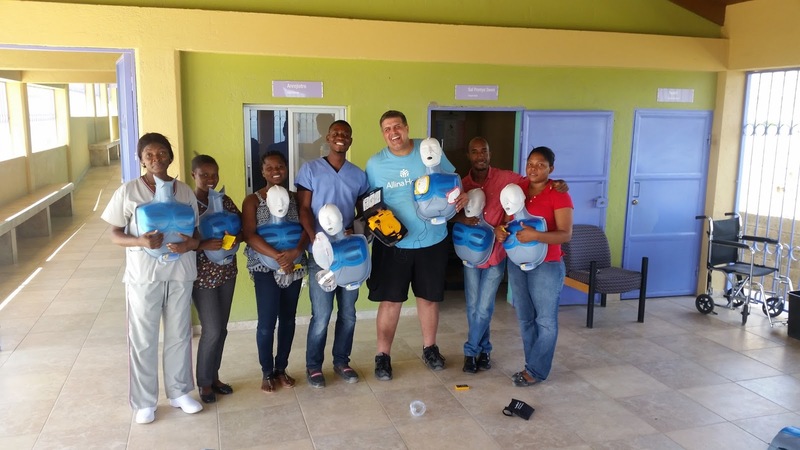 Today at Grace Village while the rest of the team took the tour, I was advised that my original 2 hours for the CPR class got shrunk down to 1 hour…prep work needed to be done before it started then! I updated the AED at the Clinic and the one in the Guard Shack. Jason who works at the clinic front desk was extremely helpful and awesome to work with!! The clinic had 6 staff members attend the class, one of whom was Dr. Gregory. This was such a fun class and I can say that not only did we complete a Healthcare Provider course in an hours time, but we did all of that with translating everything…God is amazing and it was His will that the class happened and by His grace I was able to teach it successfully with everyone feeling good about what they learned!! This was my favorite part of the trip so far and I really am looking forward to hosting another class for the staff on Monday here at Guest House 2. Thank you Healing Haiti for allowing me to help and be helpful, my heart is happy!! Marcia, Lori and Caron also had the opportunity to utilize their work knowledge at Grace Village today. A few days before flying out we were notified that the lab needed assistance with setting up a new urinalysis and chemistry analyzer. It was a great experience and we were blessed to work alongside the laboratory tech. She did a wonderful job while we overwhelmed her with much information in just a couple hours!! 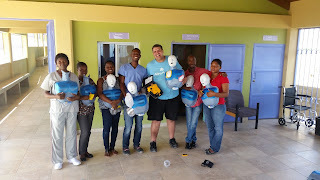 It was a fun experience to see how a Haiti lab functions! !